All the parking lots in Larkspur Landing. Image from Google Maps. There’s no question that Larkspur Ferry has an access problem. If you drive, there’s a vanishingly small chance you’ll get a parking space after 8:30am. If you don’t drive, your options are to live in the neighborhood, walk for almost a mile along the freeway, bike for 15 minutes from the Transit Center, or take the miserably slow GGT Route 29 bus. In response to this perceived lack of access, GGT is again investigating some exceedingly expensive parking garages paid for by a new parking fee. (They had last discussed a parking solution in 2007, when ridership was about what it is today.) While this would expand access, this solution fails to take into account the breadth of options available, including 520 unused parking spaces in Larkspur Landing that already exist. An old adage marks best practice for facilities design: organization before electronics before concrete. The first, organization, rearranges existing resources to maximize their utilization. The second, electronics, upgrades the systems you already have so you can make even better use of your resources. The third, concrete, adds resources to your now-optimized pool. By prioritizing cheaper solutions before expensive ones, organizations can save a lot of money. 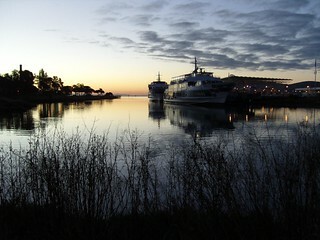 In the case of Larkspur Terminal, GGT’s supply of access to the ferry (the parking spaces, bus seats, bicycle racks, housing units, and office space in the vicinity) is the resource. As currently designed, there is a shortage of access, but GGT doesn’t need to add more garages just yet. 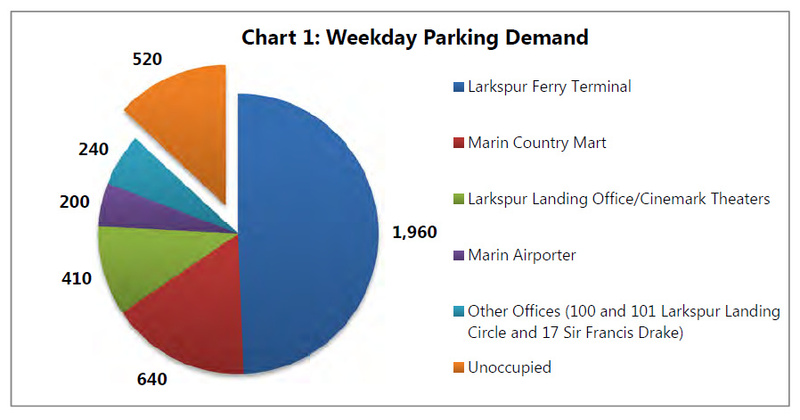 The Larkspur Station Area Plan revealed that, during the day, 520 parking spaces in the neighborhood went unoccupied. Though GGT does have a parking problem on its own property, the area’s parking supply is more than ample to meet the demand. Graphic and data from City of Larkspur. There’s a lot of demand for parking, but a lot of unused space, too. PDF here. These spaces aren’t being used because the parking supply isn’t well-organized. People driving to the ferry have the option of parking for free on the street, for free in the ferry parking lot, or for $4 per day at the Marin Airporter. The other lots aren’t an option to them, as they’re reserved for more office workers than exist and patrons of Marin Country Mart who mostly come on the weekend. Through a reorganization of the neighborhood’s parking supply, GGT could expand ferry parking by 520 spaces essentially for free. GGT, Larkspur, and the businesses in Larkspur Landing would need to work together to figure out the precise rules, but the core of any plan would be pricing: a $2 charge per day for anyone parking in the area who doesn’t get parking validated by a retail store or who doesn’t have an employee parking pass. The owner of each lot would get income from their charge. Larkspur would earmark on-street parking charges to neighborhood improvements. Coincidentally, 520 spaces is nearly the same number of spaces GGT wants to add in a large, 969-space garage. Since it would be built on 400 existing parking spaces, the garage would net 569 parking spaces. Unlike the essentially free 520, however, the 569 spaces would cost an astounding $44,000 apiece. Organization before electronics before concrete means other options should be explored before investing in costly new infrastructure. An examination of the neighborhood finds that parking already exists to meet demand, if GGT can harness it. Of course, if the politics prove impossible and those open spaces can’t be used for ferry riders, GGT will need to turn to the parking equivalent of electronics: a shuttle from the Transit Center. We’ll tackle that question next. Last time, we examined how the station got to be placed where it is. The gap in building the first and second segments gives activists a window to try to change the mind of SMART staff and board members, and by the looks of things they’ll need the extra time. After seven years, the planned site of the Larkspur station is pretty well set in stone, at least if you ask the agency. Whenever asked to move it, SMART has taken the position that the location is final. This, to put it mildly, is frustrating. How can the concerns raised by Larkspur years ago and those raised by SMART be addressed? When Larkspur first voiced opposition to a ferry terminal station, the city council was opposed to the project entirely and objected on three grounds: glare, aesthetics, and a desire to avoid renegotiating Marin Country Mart’s planning documents. The concern over glare is so odd it hardly deserves mention. Sun glints off parked cars in the ferry terminal and all over the neighborhood. Adding a train would not increase glare. A train viaduct in Berlin. Image by Jarrett Walker. Aesthetic concerns deserve more of a mention. Larkspur argued that views of the Bay would be blocked by an elevated structure and the neighborhood would be marred by a rail viaduct. Though the vista is dominated by the ferry parking lot, viaducts are very rarely attractive things, at least in the United States. Since the train would run through the parking lot of a major shopping center and across the field of view of some of the stores, SMART should take a page from Germany and incorporate the shopping center into the viaduct itself. A huge number of trains in Berlin run on elevated tracks, often running right through the city. 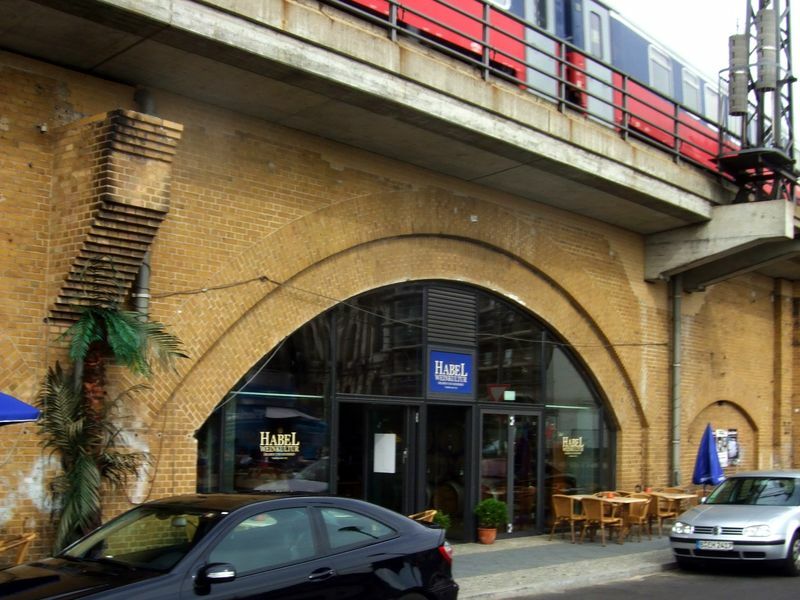 Unlike the loud and grungy viaducts in Chicago or New York City, these have been integrated into the city by becoming buildings in themselves. Cafes, shops, and restaurants have taken up residence beneath the rails. In essence, the viaducts are very long buildings with trains running on the rooftop. Marin Country Mart wants to emulate a maritime village, something vaguely European. By using the viaduct as buildings, Marin Country Mart could emulate something actually European. Though it would require cooperation from the SMART board, it would ameliorate the aesthetic concerns of the neighbors and add value to the shopping center’s owners. Marin Country Mart brings us to the third objection: planning. Larkspur officials in 2006 did not want to revise the Planned Unit Development plan that governs the shopping center, something that would need to happen if SMART extends a viaduct through their property, as two buildings would have to come down on the edge of the property. But if both parties are willing to renegotiate, there’s no reason why Larkspur couldn’t amend the plan. Extending SMART through the shopping center makes a more direct connection between the train and shopping. That means value added to the center, especially if the viaduct can be made up as nice as the ones in Berlin. Now that opposition in Larkspur has passed, SMART itself stands opposed to an in-terminal station. As far as I can tell, it’s mostly intransigence. It’s not in The Plan, so therefore shouldn’t be added to The Plan. But publicly, SMART will likely say that it’s an issue of cost (too high) and ridership (won’t change much). These are things we can assess, though intransigence might go a bit deeper. For cost, elevated rail structures like this one typically cost about $70 million per mile to build, including stations. SMART would need to build a viaduct 2,200 feet long, or about 0.4 miles. Multiply that against the average cost per mile and one arrives at $30 million. Let’s add in $150,000 for building demolition, $100,000 for EIR amendments, and a generous $1 million for land acquisition, for a total cost of $31.3 million. That brings the cost of the whole system from $724 million to $755 million. This is a bargain, especially for a project of regional significance. 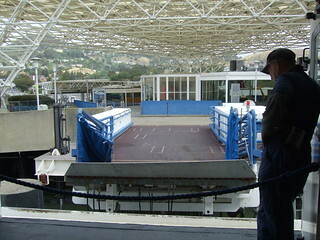 If SMART extends to the Larkspur terminal, it could transport a significant number of ferry riders. If it transports even a tenth of them (540 per weekday), the project will cost about $96,000 per trip, not counting the people who will occupy the now-freed spaces in the parking lot. The Greenbrae Interchange Project, in contrast, will add meaningful capacity for about 825 trips* in the peak hour at a cost of about $173,000 each. SMART staff have dug in their heels on this project, but that’s not to say they can’t be persuaded or forced to come up with a good plan. However, will will take time. The first thing you can do is understand the costs involved, as above. While the numbers in this post are estimates, SMART has not studied the issue in depth; they know just a hair more than I do about potential costs and ridership. Until there is a proper study, we cannot know for certain how much it will cost, nor how much benefit those monies will buy us. The second thing you can do is start to lobby boards, commissions, and SMART staff. Since a ferry/train connection is a project of regional importance, TAM, SCTA, and MTC should rank it high on their list of congestion mitigation projects. $31.3 million is a pittance compared to what is doled out in a given year, and this is a critical link in the North Bay’s transportation infrastructure. Residents of San Francisco and Sonoma have leverage as well, as the station will effect the usefulness of their own transportation systems. Golden Gate Transit needs to push SMART to improve access, too. This will directly benefit GGT’s ferry business and increase the value of their park and ride lot, should they ever decide to lease it to developers. Find your SMART, SCTA, MTC, TAM, and GGBHTD representatives and tell them you want SMART in Larkspur. *This is the number of new northbound cars that will be accommodated on the freeway. The project won’t add any southbound or HOV capacity that will be used. The original plan for an elevated station. Image from SMART. While Sonoma gets to reap the benefits of SMART, including a $15 million expansion of the IOS to the Santa Rosa Airport, Marin’s commuting public rightly grouses that it doesn’t serve their needs. Yet by ignoring Larkspur Landing for now, SMART has a chance to do what it should have done from the start and plan for a station in the ferry terminal. A core principal of transit planning is connectivity. Any network is only as good as the strength of its connections, and transit is not excluded. The strongest sort of transit connection is the cross-platform connection, which allows you to hop off your train or bus, cross the platform to your transfer and be on your way. It’s like switching planes in an airport by walking one gate over. In contrast, a weak transit connection forces riders to leave one station, walk a couple of blocks, and enter another station. Rather than boarding a connecting flight at the gate next to yours, we need to hike across the airport to another terminal entirely. Though this may be tolerable once in a while, as a daily commute it can crush even the hardiest transit enthusiast. Sadly, SMART has opted against convenience and in favor of soul-crushing. Current plans call for locating the ferry station a half mile from the ferry terminal, requiring transferring riders to either walk along parking lots and unfriendly streets or wait around for a shuttle. A commute that might already involve 2 transfers will become one involving 3. Larkspur residents, most of whom who won’t even get direct SMART access, rightly complain that this makes little sense. 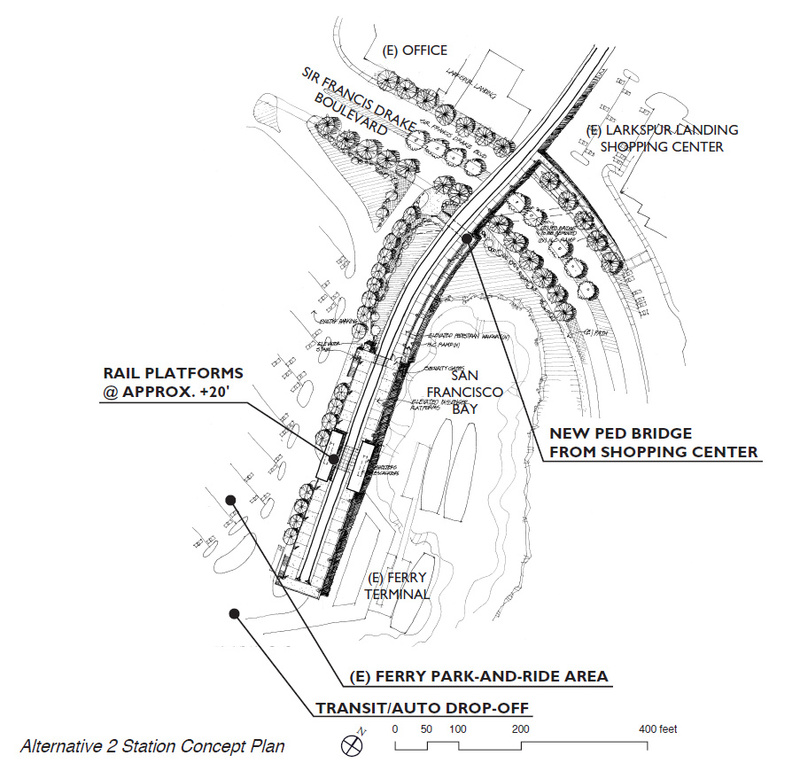 The Station Area Plan for the Larkspur Landing neighborhood calls for relocating the station into the terminal and decries the poor site chosen by the SMART board. SMART’s draft environmental impact report contained a draft plan (very large PDF) to put the station in the ferry terminal. Back when station sites were being planned, staff created four alternate proposals for Larkspur, including two with better access to the ferry. The best one placed the station adjacent to the current terminal entrance at the end of a half-mile of elevated track. Given the current going rate for elevated rail, this option would cost about $30 million plus land acquisition costs. That’s about one-fifth the cost of the Greenbrae Interchange Project next door. Yet at the request of the Larkspur City Council (PDF), SMART went for the station plan staff explicitly recommended against. The city complained that the removal of two buildings would require modifying the plan that governs Marin Country Mart, and that an elevated rail line would obstruct views of the Bay. They also were concerned about cost, though Larkspur wouldn’t need to pay for the extension. Another concern raised earlier by staff is that a station in the ferry terminal would make extensions to Corte Madera or San Quentin more difficult. Though these concerns are well-intentioned and should be addressed in any plan to relocate the station, it’s foolish to scuttle a dramatic service improvement over parking lots and fantasy expansions that are decades from reality. And here is where we have a new opportunity. By splitting construction of the line in two, SMART has given Larkspur residents a chance to change that seven-year-old bad decision. Nobody likes to run across an airport to catch a plane, and no commuter likes to walk across a half-mile of parking lots and traffic to make a transfer. Larkspur needs reverse its earlier request and demand a world-class transit connection, and residents should ask for the same. And SMART should listen. Next time, I’ll examine the city council’s original concerns and how they might be addressed.